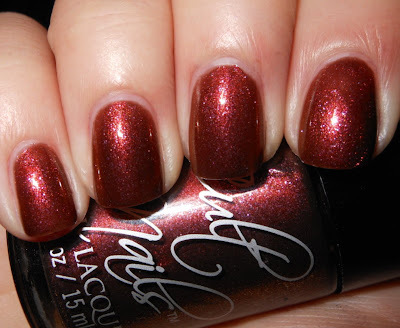 I have the newest Cult Nails Behind Closed Doors Collection to share with you today. Maria kindly gave the Central Florida Beauty Bloggers her newest collection review last weekend. As usual, this collection has a great variety of colors and finishes. I think there is something for everyone in this collection. I will be using Cult Nails's descriptions for these polishes. Afterglow, Disciplined, Flushed, Bitten, and Coveted. Afterglow is a copper infused with a subtle pink shimmer. If copper and bronze had a baby it would be Afterglow. This is not a color I would typically gravitate towards, because I find warmer metallic shades to not work well with my skin tone. This was completely flattering. I think what makes this is the pink shimmer. It adds a unique twist that really compliments the base color. This was 3 coats. It goes on sheer, but builds up nicely. Disciplined is a sheer but buildable soft grey with purple, pink and blue shimmer. This color reminds me of mist. You know how mist looks in the mountains in the distance or the misty weather you get on a cold morning just before the sun comes up? This is what this color is to me. It is really unusual and different. The base color has a touch of murkiness to it that keeps it from being your standard grey. The addition of the colorful shimmer is unexpected and a great touch. This was 3 coats. Flushed is a true Blurple (blue/purple) buildable sheer with an intense purple/pink shimmer effect. We have a winner! This is my standout favorite. Just look at it? How could you not love it. It's a beautiful purple with a fiery pop in your face pink shimmer. You can't lose. You need this. Get it now. This was 2 coats. The end. Bitten is a raspberry glass flecked polish. This is significantly more sparkly than my camera picked up. I'd call this a jelly in my book. I think this would be an awesome layering polish too over darker colors. This was on the sheer side, and I used 3 coats here. I feel like while the formula on this was smooth and easy to apply, it was hard to get even coverage as far as the color with this one. This one would probably benefit from a more careful application. I'd suggest using thin coats while waiting for it to dry in between. Coveted is a jelly deep green with metallic green flakes and subtle green shimmer. This is a beautiful emerald green shade. It is deep and rich. Greens can be tricky with my skin tone, but I think with a shade as deep as this, it will be flattering on most. The shimmer in this is gorgeous. The flakes are a cool addition. Personally, while I'm never one to turn down flakes, the shimmer in this could of held its own in this polish because it is simply that stunning. This has the best of all those deep jelly and glittery green polishes that have become classics among nail polish addicts in one polish. This is a beautiful collection. I love the range in Cult Nails' collections. They have more subtle shades, fun shades, and some completely new to me original shades in all of the collections. The formula on these polishes were superb. Excellent formula has always been my experience with Cult Nails, and this did not disappoint. If you had me choose favorites, I'd go with Flushed and Disciplined. You can purchase this entire collection on the Cult Nails site for the preview release sale price of $40 until Thursday November 15th. Starting November 16th, you will be able to purchase these polishes individually for $10 each. 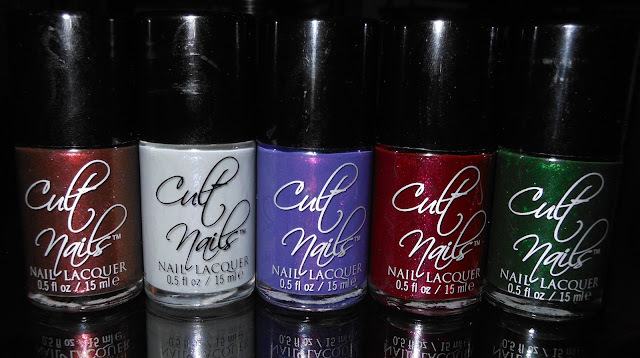 *I received these polishes to review honestly by Cult Nails. Thank you for the great swatches. I've been waiting for yours. There are three that I need to pick up when I order more base coat next week. Hi Stephanie..question how is flushed ~ Similar to Milani TotallyCool, Claire's Magic , I love Colors like that but I think They are close ..no cigar...Help; The green Coveted is so pretty I want those 2. I don't have Claire's Magic, but from pictures I think Flushed is lighter, and the shimmer is brighter. I do have Milani Totally Cool, and that has a glass-fleck glitter. Flushed has s very dense shimmer, there are not any glitter particles in Flushed. Gorgeous swatches Steph, Flushed looks like perfection on you! Drooooool.... When will my package get here already?!! Gorgeous pictures as usual. Flushed and Disciplined are my must-haves. I think I'm going to pre-order because I want to know what Afterglow looks like on my skintone. So funny - every review I read of these the bloggers 'picks' differ...yesterday (I think it was yesterday - time flies) it was the green one Coveted, Bitten & the brown one not shown here were the must haves! I am getting ready to order mine - I needed to wait to see some swatches before I ordered the full collection as my stash is too large now and I don't need to buy shades that I won't wear...I might not wear the brown one in this group but right now cheaper to buy the whole collection. I like the green here a lot but typically don't wear these greens but a few weeks out of the yr - maybe that will change as I did not used to wear blues that much like I do now yr round. I also need to get a new bottle of her clear topper and pick up the sheer effects I wanted from the previous Cult collection. Oooo I am so jealous of you ladies who got this collection! It's simply AWESOME!! Cult Nails never disappoints!